The Video Enhancement tab lets you apply filters and effects to your video display, giving you a new viewing experience. · Cinema Enhancement: Increases the crispness of the video to reproduce cinematic quality using Corel technology. · De-snow: Enhances and produces a clearer image. · Up-scaling: Applies a more realistic and natural effect with Basic and Advanced options. · Sharpness: Enhances the details in the video, creating an etched effect. De-block: Uses the deblocking filter of the h264 codec. It produces outstanding video quality at low data rates. Note: Video Effects may or may not be available, depending on the disc being played. 2 In Deinterlace, select the method to use if your video content requires conversion from interlaced to progressive scan. Two basic techniques of deinterlacing are weave and bob. · Auto: WinDVD automatically determines the correct deinterlacing method. · Force Bob: Creates a full frame from a single field by doubling each line. This technique gives you a slight blur. · Force Weave: Combines two consecutive fields to one frame. This technique gives you a sharper picture. Progressive: Progressive deinterlace is the current state-of-the- art video technology, capable of converting 60 interlaced fields into 60 progressive frames, doubling the video data rate for smoother movie playback. 3 Click the Smart Stretch drop-down menu and choose the setting you desire to enable/disable Smart Stretch. This feature compensates for the difference in aspect ratios when viewing 4:3 content on 16:9 or vice versa. It minimizes the distortion by stretching only the edges of the video and maintaining the original content at the center of the image. · Off: Disables the Smart Stretch feature. 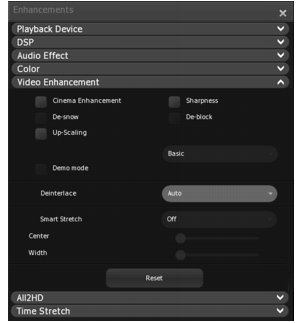 · Stretch to 4:3: Adjusts 16:9 video content to fit the 4:3 aspect ratio. Move the Center and Width slider to your viewing preference. Stretch to 16:9: Adjusts 4:3 video content to fit the 16:9 aspect ratio. Further customization can be done through the Center and Width sliders if they are available on the content being played. To return the settings to default values, click the Reset button.